Salvation And Survival: The Political, Theological, and Spiritual Aspects of "Globalism"
The Political, Theological, and Spiritual Aspects of "Globalism"
That word globalism ... It is a word bandied about in this political season, and depending on who is using it, it can mean a common-sense word for the necessary global exchanges in an increasingly interconnected world -- like trade, legal immigration, and the cooperation and sharing of ideas across borders. Think of it as kind of a benign worldwide partnership, if you will, with no borders to hinder relationships. But, in the hands of malevolent minds, it turns into an ideology and near-religion; focused on a one-world government. What concerns me is the effort to equate globalism with Christianity. 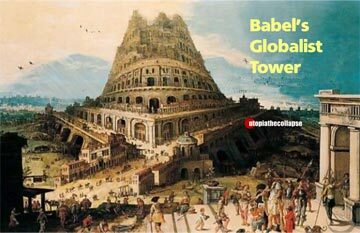 Those who promote the secular belief in globalism will tell you that just like the Church, their ideology is global; and just like the Kingdom of God, there are no borders. But here's the question that they can't -- or won't -- answer: Exactly how does the Kingdom of God fit into this collective ideology? Who decides the value systems of that global cooperative? Because, as I have discussed before, the Kingdom of God is the government of God; how He rules His people, as King, through His people. It is the realm in which He rules, and it is His rules that we are governed by. Are the globalists prepared to accept that condition? I think not. And that's because a world in which globalism rules will be a world in which the righteousness, justice, and peace of Jesus has no place. Globalism spawns a world of evil and injustice; rather than peace, there is conflict; and rather than joy, there will be misery. There is one thing we better get clear on ... it doesn't matter whether it is a politician, the United Nations, or the Pope touting globalist ideology; it will mean that there will be no truth, or mercy, or knowledge of God in the land. The social justice message [justice in terms of the distribution of wealth, opportunities, and privileges within the world] is one meant to soothe our guilty souls over the injustice perpetrated by godless men. Globalists will promise it, but they cannot deliver. To begin with, the very idea of no borders or boundaries is antithetical to our knowledge about God and His character. The Bible is full of examples of God setting boundaries, beginning with the boundary He set for Adam and Eve to abstain from eating from the tree of the knowledge of good and evil. Later, throughout the Old Testament, God establishes boundaries and borders for the nations, with the Bible stating in Job 12:23, He makes nations great, and destroys them; he extends the boundaries of nations and disperses them. And now that very knowledge of how God established the nations is threatened by this humanistic religion focused on globalism. The Globalists claim that the world can come together in a spirit of human cooperation and understanding; that there is a global "truth" that can bind us together as one. But true wisdom and understanding always begin with the knowledge of God. When the people of the world forsake the knowledge of God, soon truth and mercy are both gone. Truth must be rooted in something more than our personal opinion, and mercy means going beyond our own self-interest. If the world adopts this globalist attitude and policies, the knowledge of God will be left behind. And when truth and mercy are lost, there is no longer any restraint against our human nature. We already see that idea promoted in our advertising campaigns ... No rules, just right; Just do it; Break all the rules; Peel off your inhibitions and find your own road ... The message is the same: You make your own rules. You answer to no one. You are the one that matters. Your universe revolves around you. You should only restrain yourself if you want to. in another failed attempt to control humanity. But here is what we need to deeply understand: When man will not, or cannot restrain himself, bloodshed and destruction follow. And that is at the heart of the anti-Christ spirit at work in the globalist ideology. An article by Fay Voshell at The American Thinker website stated it perfectly: "Like the Christian vision of the universal Kingdom of God, the religion of secular globalism claims universality, but [it] is an earthly minded substitute for the Church universal. The Christian vision sees the Church universal as God's kingdom ruling the earth. The religion of globalism sees an earthly, utopian world order in which all men pay allegiance to elite priests who rule over a World City without national borders." Isn't that ultimately what Nimrod was trying to accomplish at the Tower of Babel? Ms. Voshell goes on to point out that the idea of "globalism" is really nothing new. This idea of a "new world vision" is the same one that has given birth to all empires. "Whether the vision of Hellenization dreamed of by Alexander the Great; whether the vision of eternal Rome ruled by demi-god Caesars; whether the vision of a Thousand Year Reich ruled by a noble race; whether the vision of a global communist international brotherhood in which the common man was to reign -- the actualization of the imperial, earthly vision of man is always the same. Human beings are regarded as units to be ruled by powerful others. Human beings are enslaved." It is all the same message, from the same Anti-Christ spirit, meant to strip us of our individual uniqueness; take away our belief in something greater than ourselves; and ultimately replace the Judeo/Christian concept of the human being with a de-gendered, robotic and compliant unit -- a nonperson who is merely a number in the soulless world collective. 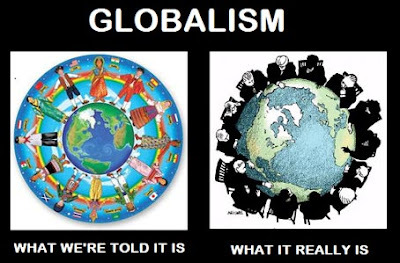 It really all comes down to this ... the political and social concept of globalism is a useful tool for God's Enemy to introduce an anti-Christ religion that believes in nothing [and everything] -- all at the same time. But that is no real faith at all. When we are all reduced to a unit, or some other kind of nonentity, we have nothing to be loyal to, or faithful to. We do not see the value in a human being, let alone see ourselves as spiritual beings made in the image of our Creator. And then we have nothing to believe in, and we are easily enslaved to a new world order in which the Enemy determines our value. It is a world governed without God's moral system and righteousness, without His Truth, without His Justice, and without His Love and Mercy. The catchwords of universalism, secularism, and globalism are meant to appeal to our human desire for world peace and equality among all men. But, in reality, they are designed to strip us of our unique individualism and our identity as a distinct and unequaled Child of God. We don't need a new world order ... we all need to identify as citizens of the Kingdom of God. And when that day comes, it will be YHWH's system of government and His authority that will rule and reign on this earth! Daniel 2:44 "And in the days of those kings the God of heaven will set up a kingdom that shall never be destroyed, nor shall the kingdom be left to another people. It shall break in pieces all these kingdoms and bring them to an end, and it shall stand forever..."